Reader since 8. Writer since 4. Believes in keeping her nose in a book. Her horcrux is a black pen. Her heart beats in a dog. Found in dusty old bookshops, if not loitering in the Wizarding World of Harry Potter. Favorite Characters: Sherlock Holmes, Liesel Meminger, Severus Snape, Florentino Ariza, Behemoth. Is Rachel evil or not? Is she responsible or not for Ambrose's death? Is she innocent or guilty?The centre point of the story that is left unanswered! Philip Ashley is orphaned at an early age and is raised by his old cousin Ambrose Ashley in Cornwall. Due to health constraints, Ambrose makes a trip to Rome to spend the winter there and while traveling he meets his distant cousin and widow Countess Rachel Sangaletti, a woman Philip has never heard about before. Quite to Philip's surprise, Ambrose falls in love with Rachel and they get married. While away, Ambrose keeps writing to Philip and telling him about his whereabouts. Slowly, the letters grow infrequent and once or twice, Ambrose mentions that he has fallen sick and no matter what treatment, he does not seem to recover. It greatly concerns Philip when one such letters reveals that Rachel has somehow been involved in his degrading health, that she was poisoning him and her behavior toward Ambrose has drastically changed. Ambrose asks Philip to visit him in Italy right away as with his present condition he will never be able to return to Cornwall. By the time, Philip reaches the villa where his ill cousin and his wife had stayed, he is dumbstruck to know that Ambrose is dead and that his wife along-with an old friend by the name Rainaldi has left the house with all the belongings except for his cousin's hat.Devastated and angry at the same time, Philip is certain that this wicked and cunning cousin Rachel poisoned his Ambrose to death and is so bitter of her that he contemplates the bad nasty treatment he would favor in return when he meets her one fine day for having been instrumental in his cousin's death whom he so dearly loved. However, when Rachel visits him, he is stunned to see her in person and believe if she could've ever been responsible for Ambrose's death. This new Rachel is so beautiful, sweet and charming and still mourning her husband's death, quite contrary to what he had imagined her to be.Gradually, as the story unfolds, in spite of her suspiciously mysterious ways, Philip cannot stop but fall head-over-heels in love with Rachel to an extent of obsessive madness when he gives away all his ancestral wealth to Rachel disregarding all warnings and hints that keep coming his way about Rachel's secretive social and monetary affairs with Rainaldi.Toward the end, Philip starts to suffer with the same headache and fever pangs like Ambrose did and one fine night he discovers that Rachel has been poisoning him too. He realizes what Rachel has been doing and plans to gather enough evidence and uncover her wicked traitorous ways but Rachel dies in an accident by falling off a newly constructed bridge. ********************************************************************My Cousin's Rachel is the work of a genius with the kind of intricately woven tale of mystery that it is. 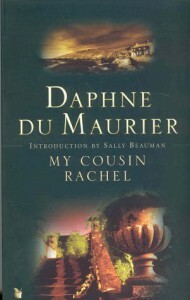 An extraordinary psychological thriller that keeps you awake right through the late night hours upto the early morning ones just so you can satisfy the building curiosity, the one question - Is Rachel really a shrewd woman responsible for her husband's death or merely a weak woman mourning his death?The plot is well organized and described by Miss Maurier. All the places, the countryside, characters, their psychology in different situations, and how little things can influence the thoughts of even the most headstrong individuals. The steady suspense built that keeps growing intense after every page is truly astonishing and keeps you digging through the book till the very end. Although it might appear as a traditional slow moving story but it keeps the reader captivated nonetheless with the intriguing mindly manipulations and rapturous compelling character descriptions from the silliest to the smartest.In short, it is one of those cozy books that you can read through the day sitting on the porch with infrequent sips of tea and enjoy it tremendously despite the ambiguity caused by the author.Highly Recommended! !